the 1984 movie "The Killing Fields"
It has been off the air for about a year and a half, but I just recently watched the series finale of “The Newsroom”. The final major storyline revolved around Charlie Skinner, played by Sam Waterston, who was the news director for the fictional Atlantis Cable Network. 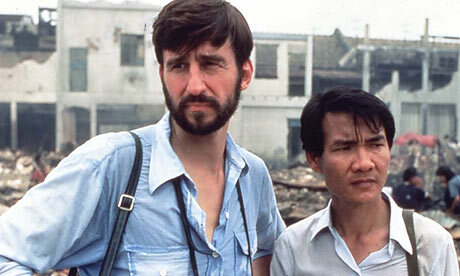 As the show ended, I was reminded of a simple thought: Sam Waterston has been playing journalists since the 1980s. The year 1984 was not that far removed from the years of tragedy, strife, and brutality in Cambodia, or Kampuchea, as its despotic rulers had renamed it. The evil regime of Pol Pot had laid waste to the country, butchering thousands in its quest to reshape the country in its own twisted image. Through it all, journalists were risking their lives to report on the events going on in Cambodia. One such journalist was Sydney Schanberg, played by Schanberg, who worked closely with a journalist, guide and interpreter named Dith Pran, played by Haing S. Ngor, who stayed behind to cover the fall of the capital to the Khmer Rouge. It was Grade 10, and I was always up for a movie. 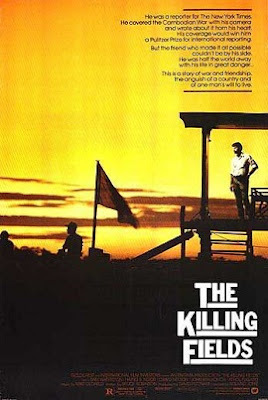 as Dith Pran in their seminal roles in "The Killing Fields"
It was another one of those movies I watched with my sister. This one too was at the College Cinema, or Woolco as it was known. It was a pretty incredible movie, which I have seen only once, but it was still incredibly powerful. It documented the journey of Sydney Schanberg and Dith Pran, who had very different experiences. Schanberg would get out in time, while Dith Pran was nowhere near so lucky, experiencing first hand the regime of the Khmer Rouge. Haing S. Ngor brought a special sensibility to the role of Dith Pran because in real life he had been a doctor when the Khmer Rouge seized power. Ngor had to deny his identity as a doctor and served time in a concentration camp. He is one of only two non-actors in history who won an Oscar. However, he would go on to further acting roles before tragedy would strike. Haing S. Ngor was scheduled to have a guest spot in “Alfred Hitchcock Presents”, in which he was to play a Vietnamese soldier in a remake of the Ambrose Bierce short story, “An Occurrence at Owl Creek Bridge,” but that never came to pass. He also had guest spots in “Hotel”, “Highway to Heaven”, “China Beach” and “Miami Vice”, as well as various movies. However, before he could do much more, he was murdered in 1996 outside his home in Los Angeles. Waterston would have a prolific career, including roles in the TV series “I’ll Fly Away” and “Law and Order”. He also appeared in a lot of movies, including, “Hannah and her Sisters”, “Lincoln”, “Crimes and Misdemeanours”, and “Nixon”. Of course, one of his most recent television roles has been on “The Newsroom”. Sam Waterston may be best remembered so far for his role in “Law and Order”, and lately in “The Newsroom”. However, for me, I will always remember his role, as a passionate, bearded journalist covering a period in American history the country would rather forget. There really are not a lot of movies I can think of about the Cambodian component of the Vietnam War, and even fewer from the perspective of the Cambodian people tormented by the tyranny of Pol Pot and the Khmer Rouge. “The Killing Fields” shines a light and that dark conflict that had so much bloodshed, both during the war and afterwards, under the regime of the Khmer Rouge. It reminded me of the late Haing S. Ngor who would have every right to just put his experiences under the Khmer Rouge behind him and begin a new life. Instead, he took on an acting role, even though he wasn’t an actor yet, to bring attention to the conflict in Cambodia. It is obvious his own experiences informed his role in “The Killing Fields”, a role so powerful it won him an Oscar. Pretty good for a doctor who came to acting later in life. What is interesting is you could almost draw a line from Sydney Schanberg in the 1970s to Charlie Skinner in 2014. When you watch “The Newsroom”, Charlie Skinner is portrayed as an experienced journalist who actually covered the Vietnam War. He could easily have been Sydney Schanberg. That’s what makes this so neat. Once a journalist, always a journalist.